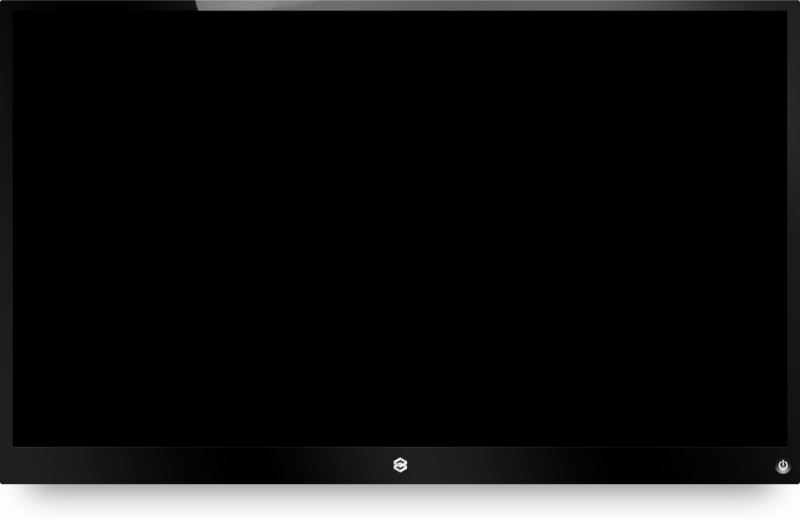 Watch a Video OverviewWatch a Video OverviewWhat is Outdoor Living Design Software? Transform 2D drawings into 3D, effortlessly. 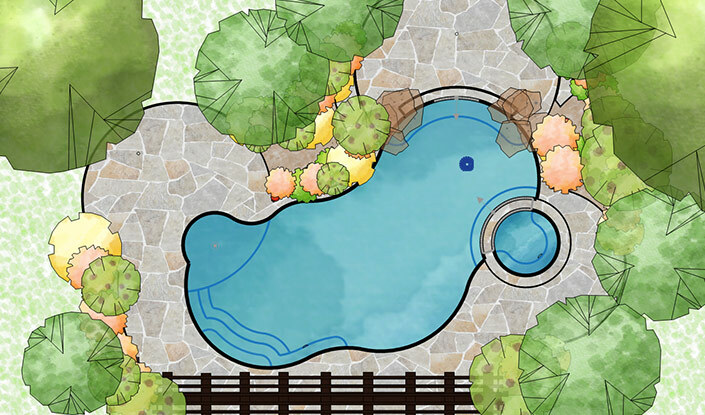 The game-changing 3D Pool and Landscaping Design Software built for today’s game-changing designers. 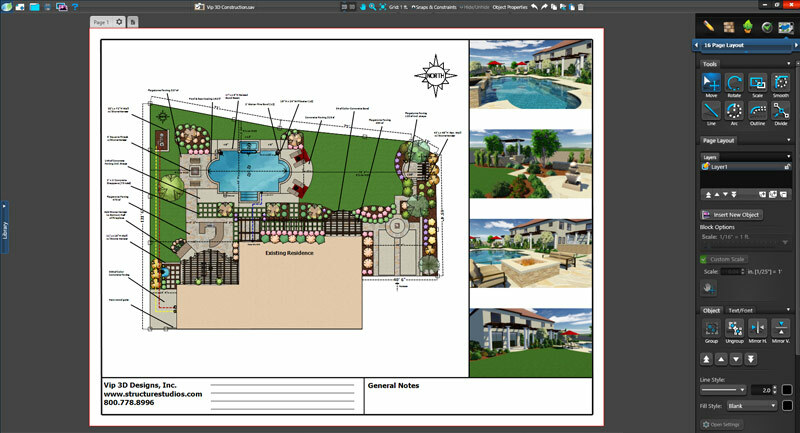 With Pool Studio’s intuitive interface and powerful tools, it’s simple to draw outdoor living projects in 2D and then create a custom, shareable, fully interactive 3D presentation of your design with just one easy click. 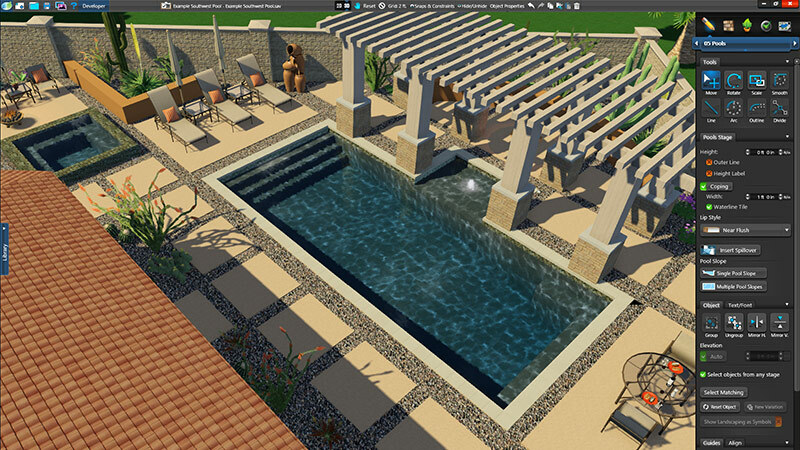 Pool Studio is 3D pool design software made easy for everyone, whether you live and breathe AutoCAD or you don’t even like turning on your computer, this professional landscape design software is for you. A design process that understands your design process. Design anything in just a few clicks. 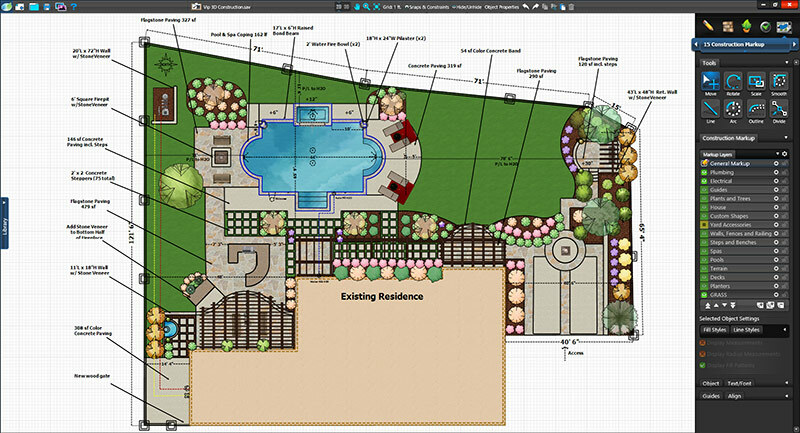 The streamlined workflow — with smart design stages and flexible tools — makes it simple to create extraordinary pools, landscapes, and more with unprecedented ease with the professional landscape software. Today’s best professional landscaping software gives you powerful, precise tools, so you can deliver incredible results, easily customized with thousands of high-resolution, fully rendered products and materials in the 3D library. Drag-and-Drop to Select the Perfect Finishing Touches. The built-in content browser gives you access to more than just the basics. 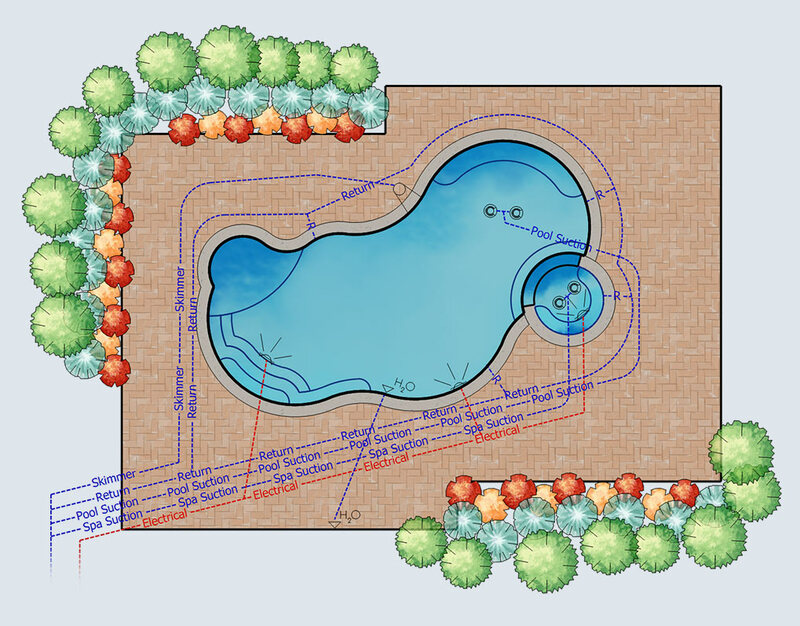 With 3D pool and landscaping software that speeds up your design process, you can search for exactly what you want or explore options by exploring categories. Preview design templates, create templates of your own, search for furniture (and decorations, plants, trees, materials, and more), and save your favorites for easy access. Then just drag and drop your selections directly into your design. Explore projects in rich detail. Create an unprecedentedly vivid experience for your clients. 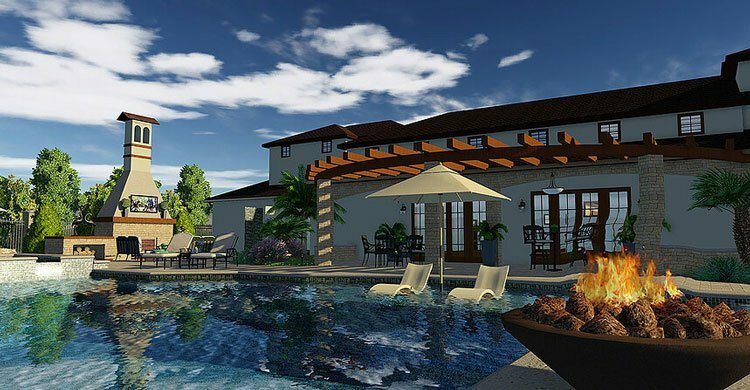 With the unique interactive presentations of the best 3D pool and landscaping design software, give your clients a clear understanding of their project in extraordinary detail. You can lead them as they walk or even fly through their future space, exploring the personalized features, transitioning from day to night, listening to the lush nature sounds, and imagining themselves enjoying their space with professional landscape software. Capture the perfect angle to share. Simplify sharing with your clients with easy-to-capture photos of any angle, at any time of day or night. The creative possibilities deepen when you use landscaping software to choose the perfect camera points. You can email, print, or share your photos on Facebook and Twitter — or directly with your client to share with friends. Select from sophisticated artistic effects, and showcase features worthy of attention at up to 8K resolution with the professional landscape software. A perfect video. Created seamlessly. Tie together even intricate projects effortlessly with the video storyboard. Pool Studio and VizTerra set the new standard for 3D pool and landscaping software by making the video production process exceptionally easy: in a single step, smooth, professional videos are simple to create. Assemble shots to highlight details, rearrange featured locations in your pool landscaping project, and add and sync sound for stunning videos — which you can immediately share on Vimeo and YouTube. Click and drag to look around. Click on hot-spots to change your view. 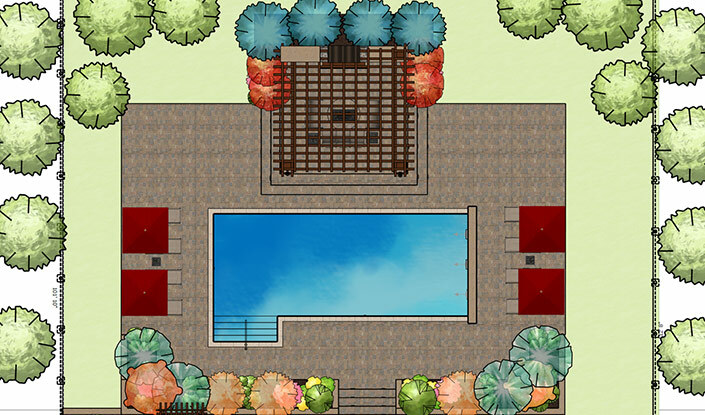 Exploring every richly layered detail of your client’s future pool landscaping and outdoor living space now takes no more than a simple click. 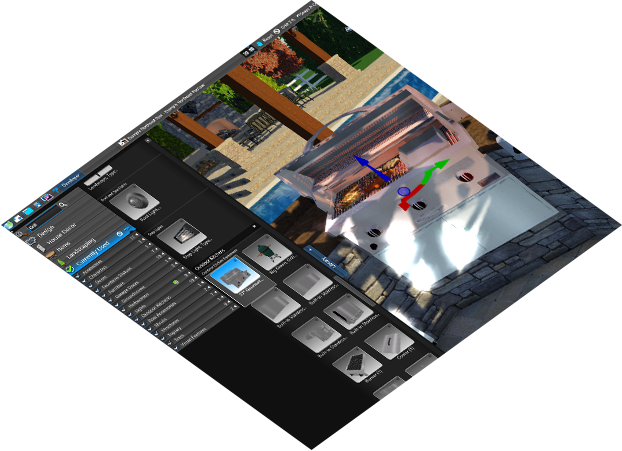 With Vip3D, one click creates interactive 360° screenshots, images, and videos — ready to be discovered from every angle. 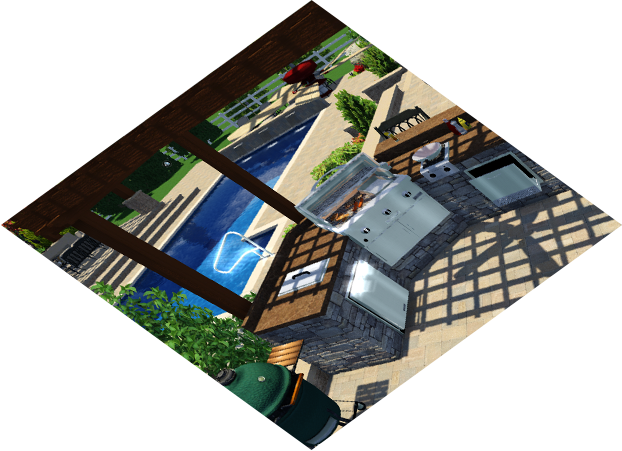 Click again to launch Virtual Reality in Vip3D, and transport your clients to see the future: their pool landscaping, lawn, or outdoor space — fresh, vivid, and absolutely amazing. Your design concept, your construction plan. 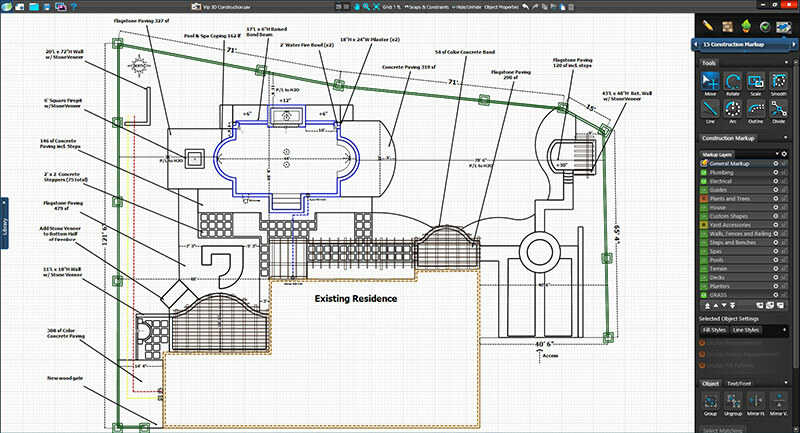 With the powerful, customizable construction layer, you can eliminate the hassle of drawing up construction plans. Add symbols, plumbing, electrical, and gas lines immediately and directly to your design. Hand off your plans to your crew with confidence — choose your own line styles and fill patterns to create construction plans that are easy to read in the field. 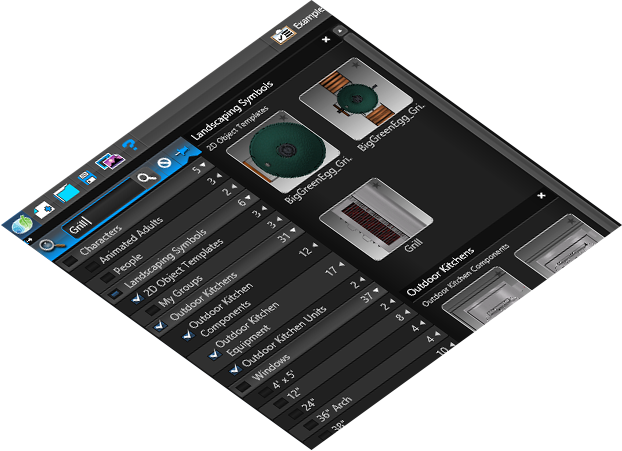 And add 3D views to clarify complex construction elements. Get the numbers you need. Speed up your final calculations — simply click to measure. It’s easy and automatic. Select all of your plumbing lines to calculate the total length of pipe your project requires. Select any object to automatically calculate its area, perimeter, or material square feet. Triangulate key points with the measure tool. Any measurement you need is instantly calculated, ready to be dropped into build-ready construction plans. Bring construction plans to life, colorfully. Choose from unique color options to improve on old-fashioned coloring techniques. 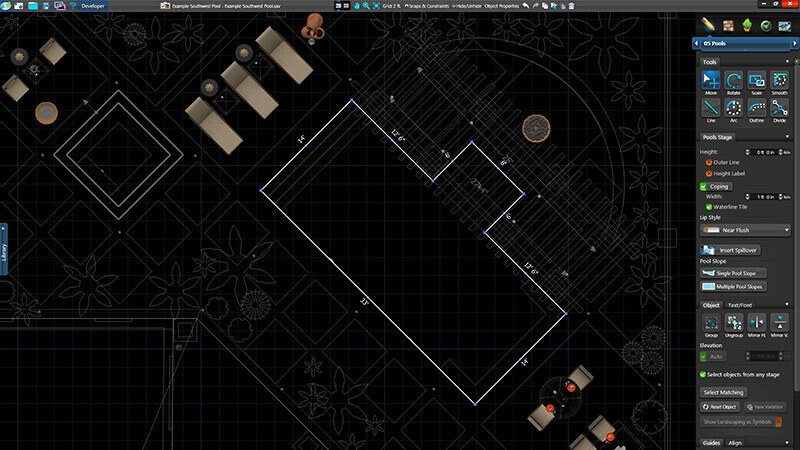 With one simple click, VizTerra and Vip3D members can experiment with detailed construction plan options. Apply accurate color to construction designs, customize construction symbols, and even select artistic hand drawings that reveal the beauty of your work — and add extraordinary depth and richness to your design presentations, faster than ever before.